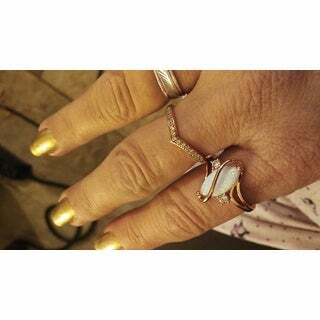 The is s very pretty, petite ring. Treatment code L (Lasering) for main stone. See Treatment Guide for all treatment code information. This ring is so unique, I have never seen anything like it. It is so beautiful!! I have always loved opals and I thought they were very expensive. This ring has a large opal with a lot of fire (the bright colors inside the ring). The price is SO reasonable. I am absolutely happy with this ring. This ring is simply stunning. The rose gold brings out the pink hues of the opal in a beautiful sparkle. And the cubic zirconia is a perfect accent size, not too big and gawdy. I just love this ring!!! Love love love the colors of this opal. This is my grandmother's favorite stones. I will be thinking of her when I wear this ring. And yes I would definitely purchase and recommended this ring. I have never been a ring wearer but after buying this ring I wear it all the time . Beautiful rose color is different than lost of what you see out there. Beauthyful style, Opal goes great with the bracelet I purchased love how this ring is finished and the size is perfect! Pretty ring. Manufactured Opal shows off all sorts of colors in bright lights. The rose gold setting compliments the pink in the stone. Cubic Zirconia sparkle in bright lights. Beautiful!! True to size. I ordered two of these rings: one for my daughter and one for myself. Both of these rings have very high quality stones, with lots of “action” in them. When you put these lovely rings on your finger, you can’t quit looking at them bc of the constant movement in their opals. The unique design is a plus!! When I saw the great price, I couldn’t believe it! I didn’t expect much, but boy was I ever surprised!!! Go for it, Ladies!!! You won’t be disappointed!! Love it and more beautiful than I thought. 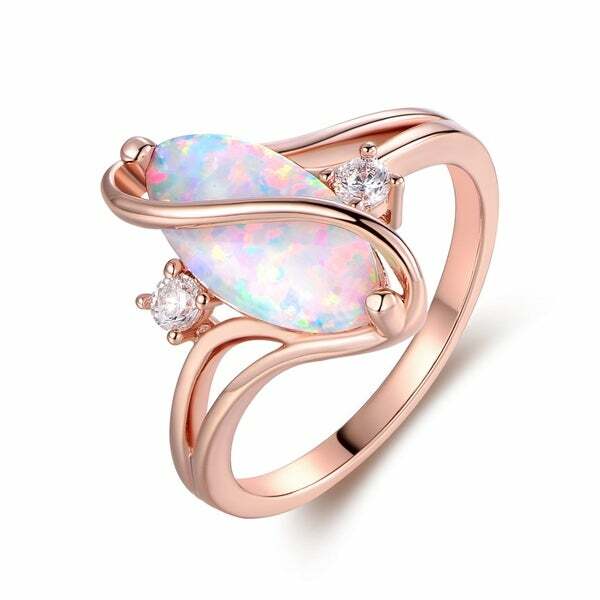 Beautiful opal rose gold ring, very feminine and classy. The cz adds a special touch that hi lights the opal stones, looks lovely on my hand. This ring is gorgeous! I've gotten so many compliments on it. It looks much more expensive than it is. It compliments many of my clothing choices. I would highly recommend this ring to anyone who wants a stunner on their finger. This is a beautiful ring and comfortable to wear. Beautiful ring. Rec'd many compliments. Design looked wonderful on my finger. It seemed to run a bit large for 7, but easy to figure out a way to keep it stable. Yes, it is beautiful, and very nice quality. I like the elegant appearance of this ring. Love this ring it fits perfectly on my finger. Happy with this purchase. "It's plated, what is the base metal?" It is beautiful and unique. I cannot wait to receive it.